Fizz Free February has got off to an explosive start for 2019, with celebrities, politicians, schools and councils across the country pledging to give up fizzy drinks. Launched last year by Southwark Council, Fizz Free February 2019 is uniting people across the country in a bid to #gofizzfree and make healthy choices instead. From Sandwell to Barnsley, Kent to Newcastle, Northampton to Lancashire, councils and individual councillors have all signed up in a bid to tackle obesity and tooth decay. Many areas have followed Southwark’s lead in encouraging schools to sign up and get involved, as one of the key objectives of the campaign is tackling childhood obesity. This week, representatives from campaigning groups, health organisations, local businesses, charities and local government came together in the Houses of Parliament to hear from key speakers including Fizz Free February spokesperson Cllr Evelyn Akoto, Tom Watson MP, Mick Armstrong Chair of The British Dental Association and Ben Reynolds, Deputy CEO of Sustain. 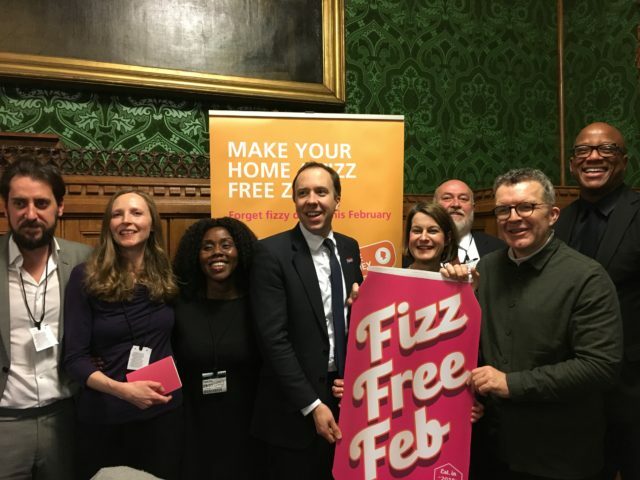 Hosted and chaired by Helen Hayes MP for Dulwich and West Norwood, the debate covered how Fizz Free February is a simple but effective way to help change habits and raise awareness of what we consume. Panellists highlighted the various ways that sugary fizzy drinks impact on physical and oral health. Mick Armstrong highlighted that dentists are still seeing children as young as three years old need fillings and tooth extractions due to decay. Tom Watson and Helen Hayes also shared their personal experiences with diabetes and how reducing sugar had played a key roll in reversing the disease. The discussion also highlighted the other important work that goes on year round to tackle obesity, like the Alexandra Rose voucher scheme in Southwark which give low income families vouchers to spend on fruit and veg, increasing access to water fountains and the need to improve and simplify food and drink labelling. The event was drawn to a close by a visit from Secretary of State for Health and Social Care Matt Hancock who has also lent his support to the campaign. Southwark is moving in the right direction when it comes to childhood obesity but there is still a long way to go as the borough is still above the London average when it comes to obesity levels. When ranked against other London boroughs Southwark has seen improvements. The borough has gone from fifth highest for excess weight in year 6 in 2016-17 to eleventh place in 2017-18, the first time since records began that Southwark has been outside the top ten in London for excess weight in this age group. For children in reception Southwark has gone from third to fourth in this age bracket for levels of excess weight. To join in, just pledge to give up fizzy drinks for 28 days and tweet us using #GoFizzFree. You can also take part by signing up on our website.